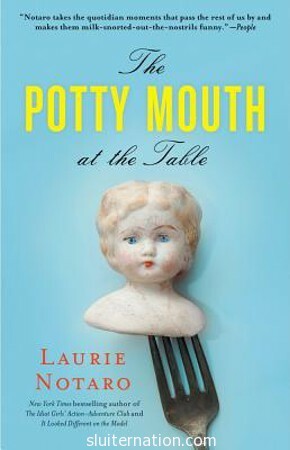 I like to laugh, so I decided to read a Laurie Notaro book. It’s really that simple. I have only read one other book by Notaro,There’s a (Slight) Chance I Might Be Going to Hell: A Novel of Sewer Pipes, Pageant Queens, and Big Trouble , and it was funny. It was REALLY funny. So I figured if Notaro’s fiction is that hilarious, her memoir stuff was going to be even better. Plus people told me, her memoir stuff is even better. So I picked the most recently published of all of them,The Potty Mouth at the Table despite the fact that all the GoodReads snobs users seemed to think this was not her best. If this is not her best? I need to make sure I am not drinking anything while I read her earlier stuff because liquid WILL come out of my nose. It’s totally a quick, easy read too. I basically read it over a weekend. And it was a busy weekend, so take it to the beach or to the pool or even just to the couch and get your giggle on. Then come back here and thank me. And you’re welcome in advance. What authors make you giggle right out loud? Disclaimer: This is not a sponsored post. I bought the book myself. The links are affiliate though and if you purchase the book through one of those links I may some day earn enough to buy one of my children something from the ice cream truck. No. Nevermind. That thing is creepy. I love books that make me laugh. David Sedaris is one who makes me tear up and snort wine out of my nose, and Chelsea Handler is so outrageous that I end up embarrassing myself in public when I read her stories. Seriously.